When has a strikingly simple proof come first? Today we discuss cases where theorems had radically simpler proofs than were first contemplated. Sir Michael’s talk is at 9:45am Central European time, which is 3:45am Eastern. It will be live-streamed from the HLF site and will appear later on HLF’s YouTube channel. We have not found any other hard information. The titles of all talks are clickable on the program, but abstracts are not yet posted there. Although all speakers are past winners of major prizes—Abel, Fields, Nevanlinna, Turing, and the ACM Prize in Computing—the forum is oriented forward to inspire young researchers. Our very own graduate Michael Wehar received support to attend last year, and one of this year’s young attendees is John Urschel, whom we profiled here. In this work we’ve essentially limited attention to System and have only hinted at how it applies to other systems. The results in full generality will be enunciated and proved in the next installment. That work will also give a fully detailed presentation of Theorem 11, whose proof was only sketched here. There are explicitly-defined sets that are not computably enumerable. For any effective formal system, the set of cases such that it proves “ ” is computably enumerable. If contains a case that is not in , then the system proves “ ” but that is false. Thus if the system is sound, must be a proper subset of . Then any yields a statement “ ” that is true but not provable in the system. The condition that the system is sound is technically stronger than needed, but Gödel didn’t optimize his conditions either—Barkley Rosser found a simple trick by which it suffices that the system be consistent. The Turing-based rollout can be optimized similarly. For one, we can define in such a way that the falseness of “ ” has a finite demonstration, and can specify “effective” so that exceptional cases are computed. For a fully sharp treatment see pages 34 and 35 of these notes by Arun Debray—scribing Ryan Williams—which I am using this term. The relevant point of comparison is that Gödel’s essence lay unperceived for decades while the leading lights believed in the full mechanizability of mathematics. Had it slept five years more, the lectures by Max Newman that Turing attended in the spring of 1935 might have ended not with Gödel but with more on the effort to build computing machines—which Newman later joined. See how David Hilbert, more than Gödel, animates Andrew Hodges’s description of Turing’s machines on pages 96–107 of his famous biography, and see what Hodges writes in his second paragraph here. The lack of Gödel might have held Alonzo Church back more. We have on several occasions noted the appreciation that methods originating in quantum computing have gained wide application in areas of complexity theory that seem wholly apart from quantum. The quantum flow may run even deeper than anyone has thought. Abel-Ruffini Theorem. Whether fifth-degree polynomial equations have a closed-form solution had been open far longer than Riemann has been. Paolo Ruffini in 1799 circulated a proof manuscript that ran over 500 pages and yet was incomplete. Niels Abel, whom we just mentioned, in 1824 gave a full sketch in only six pages, which were later expanded to twenty. This was still six years before the nature of the impossibility was enduringly expounded by Évariste Galois. Lasker’s [proof] has since been simplified: modern proofs are less than a page long. We invite readers to suggest further favorite examples. This MathOverflow thread lists many cases of finding shorter proofs, but we want to distinguish cases where the later simpler proof ushered in a powerful new theory. The flip side is when the simpler proof comes first. These are harder to judge especially in regard to whether longer “elementary” methods could have succeeded. The Prime Number Theorem could be regarded as an example in that the original analytic proofs are elegant and came with the great 19th-century tide of using analysis on problems in number theory. Of course the main open problem will be whether Sir Michael’s claims are correct. Even if he walks them back to saying just that he has a new approach, its viability will merit further investigation. Coincidentally, we note today’s—now yesterday’s—Quanta Magazine article on mounting doubt about the correctness of Shinichi Mochizuki’s claimed 500-page proof of the ABC Conjecture. The challenge comes from Peter Scholze of Bonn and Jacob Stix of Frankfurt. Luboš Motl today has coverage of both stories. Scholze, a newly minted Fields Medalist, will also attend in Heidelberg next week. Updates 9/21: Stories by IFLScience! (which I neglected to link above) and by the New Scientist. The latter has new quotes by Atiyah. 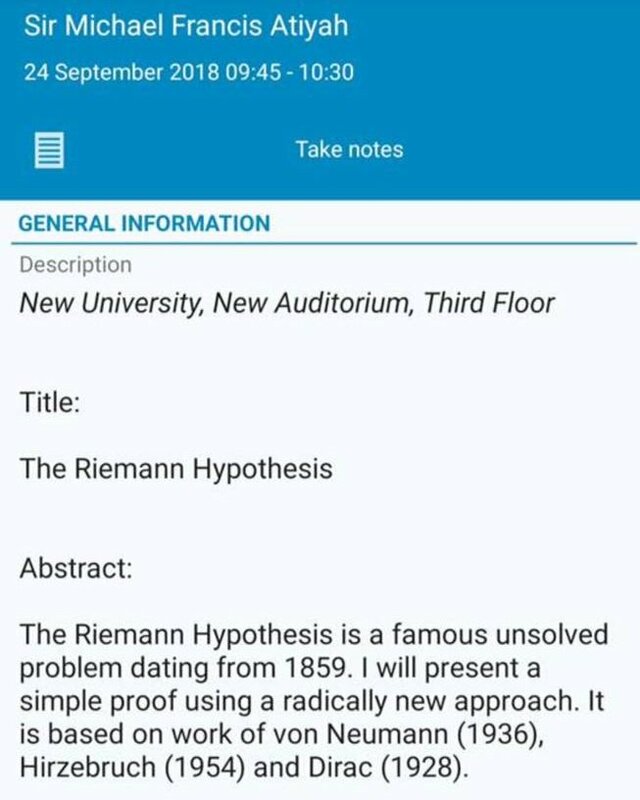 John Cook has more details about both Riemann and ABC. A MathOverflow thread has been started. Later proofs of Jordan Curve Theorem supposedly were simpler than the original one. Huge mistake, zeros all line on Zero line !! The condition that the system is sound is technically stronger than needed, but Gödel didn’t optimize his conditions either—Barkley Rosser found a simple trick by which it suffices that the system be consistent. Perhaps it’s worth reiterating that Barkley Rosser’s `simple trick‘ is actually a very `subtle illusion’! Reason: Rosser’s proof appeals to his Rule C, which is equivalent to Gödel’s -consistency. See Section 15.6 on p.112 of Chapter 15 of this thesis. Moreover, by Corollary 8.2 on p.12 of this paper in the December 2016 issue of Cognitive Systems Research, both are extraneous assumptions which imply that any formal first-order arithmetic that admits them is not sound. 1. There are explicitly-defined number-theoretic Boolean (Halting) functions that are not computably enumerable as true; if we define a Boolean number-theoretical function as enumerably true if, and only if, it is computably enumerable as, say, 1 for all . 2. There is an explicitly-defined number-theoretic Boolean (G&oumt;delian) function such that is not enumerably true; but is is enumerably true for any specified . This was the first—thitherto unsuspected, and really significant—part of Theorem VI in G&oumt;del’s seminal 1931 paper on formally `undecidable’ arithmetical propositions. 3. Expressed otherwise, there is an explicitly-defined number-theoretic Boolean function such that is verifiably true but not enumerably true; if we define a Boolean number-theoretical function as verifiably true if, and only if, is enumerably true for any specified . 4. Thus, Turing’s reasoning—in his seminal 1936 paper on computable numbers—implicitly provided evidence-based definitions of arithmetical truth/falsity algorithmically in two—essentially different, and thitherto unsuspected—ways (`evidence-based definitions’ in the sense that one can view the values of a simple functional language as specifying evidence for propositions in a constructive logic). 5. Had he not attempted to view his work as essentially reflecting, and affirming, the conclusions drawn by G&oumt;del in his seminal 1931 paper, Turing probably would have realised that the axioms and rules of inference of the first-order Peano Arithmetic PA are verifiably true, and preserve such truth, under the (weak) standard interpretation of PA; whilst the axioms and rules of inference of PA are enumerably true, and preserve such truth, under a (strong) finitary interpretation of PA as had been sought by Hilbert in the second of his 1900 Millennium problems (ergo, both interpretations establish that PA is sound). 1. There are explicitly-defined number-theoretic Boolean (Halting) functions that are not enumerable as true; if we define a Boolean number-theoretical function as enumerably true if, and only if, it is computably enumerable as, say, 1 for all . 2. There is an explicitly-defined number-theoretic Boolean (Gödelian) function such that is not enumerably true; but is enumerably true for any specified . This was the first—thitherto unsuspected, and really significant—part of Theorem VI in Gödel’s seminal 1931 paper on formally `undecidable’ arithmetical propositions. 5. Had he not attempted to view his work as essentially reflecting, and affirming, the conclusions drawn by Gödel in his seminal 1931 paper, Turing probably would have realised that the axioms and rules of inference of the first-order Peano Arithmetic PA are verifiably true, and preserve such truth, under the (weak) standard interpretation of PA; whilst the axioms and rules of inference of PA are enumerably true, and preserve such truth, under a (strong) finitary interpretation of PA as had been sought by Hilbert in the second of his 1900 Millennium problems (ergo, both interpretations establish that PA is sound). The Turing-based rollout can be optimized similarly. For one, we can define in such a way that the falseness of “ ” has a finite demonstration, and can specify “effective” so that exceptional cases are computed. Undoubtedly. Moreover, had Turing realised that his reasoning implicitly defined, and differentiated between, verifiable arithmetical truth and enumerable arithmetical truth, he would probably have defined `effective computability’ in terms of verifiable arithmetical truth; which immediately falsifies the (CT) thesis that he actually proposed in terms of enumerable arithmetical truth (as detailed in Chapter 12 of this thesis).